It was glitz, glamour and the small matter of 24 racing cars. To adapt a popular American expression: 'What would Gautama Buddha do?' The ascetic founder of Buddhism would probably have been horrified by the sights that unfolded at the 5.14 km race circuit that bears his name. No, not by the fact that McLaren-Mercedes's Lewis Hamilton and Scuderia Ferrari's Felipe Massa crashed once more during the race - for the umpteenth time this Formula One, or F1, season - but by the obscene display of wealth there. Even with ticket prices starting at Rs 6,500 for the weekend and rising to Rs 1 lakh, the parking lots were full. On October 30, it seemed that almost the entire Indian cricket team, and many more no longer good enough to be part of that team, along with a bevy of Bollywood beauties converged on the Buddh International Circuit, or BIC, at Greater Noida, 50 km from Delhi. Yet, no matter how many Ferraris and Lamborghinis filled the lots, and no matter how many Bollywood stars filled the hospitality boxes and the number of times Shah Rukh Khan implored people to watch Ra.One, they were not the true stars of the weekend. Of course, given the insane promotion budget of Ra.One it was not surprising that Shah Rukh Khan's visage made it onto the nose of the two Force India F1 cars. The true stars were the 24 F1 cars that participated in the race, each with a 2400cc V8 engine that goes at over 18,000 revolutions per minute. The roof of the grandstand has been specially designed to amplify the loud whine of the F1 engines. 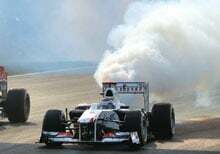 Even so, the noise the 24 engines made as they set off had to be heard to be believed. Then there were the 24 drivers of these amazing cars, who drove them at speeds of over 320 km an hour. 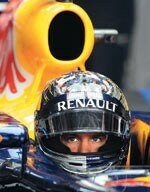 Drivers such as 2011 world champion Sebastian Vettel, who races for the Red Bull Racing team. This 24-year-old German has successfully defended his world title and in winning the Indian Grand Prix in just over 90 minutes achieved an average speed of 203.5 km an hour. Keep in mind, this was the average speed, including twists, turns and a couple of threesecond pit stops. While many in the media, especially the western media, questioned India's ability - and more so, need, given its abject poverty - to host such an event, Vettel, the youngest-ever double world champion, was gracious. "I went to see the Taj Mahal," he told mediapersons. "I know it is a touristy thing to do. But I stayed awake the whole distance and it was rather amazing to see life on the road. People here do not have an easy life, the standard of living is nowhere near that of Europe, but they look happy. I even think they are happier than many people back home." Everybody present wanted to meet one person, not Vettel, but his idol, the seven-time world champion Michael Schumacher. Finishing fifth this time in his Mercedes GP car, he still attracted the loudest cheer of the day. The race itself was devoid of any twists on the points table - with Vettel having already won the championship - and thus was actually quite boring. This was also an event that saw top businessmen gather to enjoy the show. Some, such as Sanjay Kapoor, Managing Director, Airtel South Asia, looked particularly pleased. His company was the title sponsor of the race. "As we become a global company our logo has to start appearing at global events, and F1 is a global sport," he said. MUST READ: Can F1 cash in on cricket fatigue? Others such as Carlos Ghosn, CEO of Renault-Nissan, made a quick in, quick out trip to watch the race and congratulate Vettel, whose Red Bull F1 car has a Renault engine. 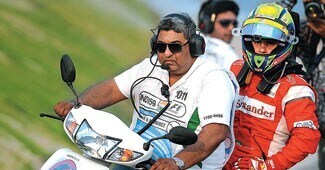 "Will we use our F1 success in our Indian advertising? Of course we will. We would be stupid not to," he said. While the 2,000-odd celebrities and wannabe-celebrities enjoyed the free food and drink as they watched the race from above the pit-lane, many other fans - there were in all 95,000 of them - most of whom had spent huge sums to attend the race were irked by the prices of the snacks being sold, and the quality of the toilets. 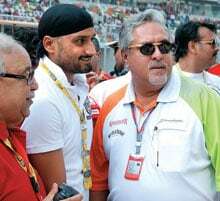 "I had a great time watching the race, but food and facilities could be improved before next year's race," said Shreekant Goenka, a businessman who had flown down from Ahmedabad to watch. Another star for many who travelled to the BIC, was the road leading to it, the new Taj Expressway. The last 15 km stretch was possibly the most amazing stretch of road built in India. Like the circuit, this road, too, was built by a private sector company. It remains to be seen if the racetrack will ever recover the Rs 1,700 crore that was pumped into its construction, but the legacy will last many, many decades.